UPDATE April 1, 2016: Melbourne IT (ASX: MLB) announced the divestment of its international domain name registration business to Tucows (NASDAQ: TCX) has been completed (see March 17, 2016 UPDATE below). The non-strategic international reseller business in the SMB division was sold for a total consideration of USD$6 million, which will be reinvested in MLB’s growing digital solutions business.“The strong strategic rationale for the capital reallocation from a declining non-core business into a growing core business will improve the overall quality of earnings in the SMB business and will accelerate MLB’s growth.” said Martin Mercer CEO of Melbourne IT (emphasis added). UPDATE March 22, 2016: New gTLD services provider Architelos files Chapter 7 Bankruptcy (liquidation): see Architelos Announces Filing For Bankruptcy | Architelos. In a turn of "poetic justice," former ICANN Chief Strategy Officer, Kurt Pritz, "architect of ICANN's new gTLD program" is listed on the Architelos website as one of Architelos's executives. No reason for the bankruptcy filing was given in the Architelos announcement, but Architelos has been involved in litigation with Afilias. "I do think that Donuts’ approach of having a large portfolio of names [185+ new gTLDs] is the right model. There is not enough cash flow to sustain a business otherwise. We at Uniregistry are just big enough but I expect that some registries will soon be people operating out of their bedrooms. Many of the new names [new gTLDs] just don’t work." --Frank Schilling (June, 2015), see Domain Mondo | Housing Bubble Like New gTLDs Mania? "We're not giving up on domains, but we are going to be realistic. There is only so far you can chase cost of acquisition and realize a reasonable return on investment and frankly the market is very competitive and there are crazy things going on in the market right now and we'd rather put our money where we can acquire a new subscriber even if it's fewer subscribers, but at higher ARPU. We think we can actually generate better revenue growth by going in that direction." -- Chairman, President and CEO David L. Brown, of new gTLD applicant and domain name registrar Web.com explaining why the company is investing $344 million acquiring a company (Yodle) not in the domain name industry (source: Q4 2015 Results - Earnings Call Transcript | Seeking Alpha February 11, 2016). What happens when you take a well-functioning competitive domain name market consisting of less than 20 gTLDs and 100+ ccTLDs, and just dump into that market 400+ new gTLDs like ICANN has done? Failing new gTLDs, which will lead to market consolidation, resulting in just a few big players dominating the market. Any competent economist could have told ICANN and its "ICANN community" that simple fact of economics. In addition, the dangers of excessive or destructive competition are well known due to the regulatory failures and excessive financial industry competition which resulted in the Great Recession--the worst financial crisis since the Great Depression. "... the financial industry must be ‘competitive enough to provide a range of services at a reasonable price for consumers, but not prone to periods of excess competition ... and competitors fail as a result with systemic consequences ..." Is competition always good? : "market competition produces at times suboptimal results" (Oxford Journals - Law Journal of Antitrust Enforcement, Volume 1, Issue 1, pp. 162-197, referencing OECD, Bank Competition and Financial Stability - OECD Publishing 27 October 2011). See more recently: A tempest of fear | The Economist - Feb 13, 2016: "... the malaise of European banking stocks has deeper roots. The fundamental problem is both that there are too many banks in Europe and that many are not profitable enough ..."
Many new gTLD registry operators are now just like the banks, Wall Street firms, credit ratings agencies, and more, which were incentivized to fail by the same, now discredited, laissez-faire economic philosophy upon which ICANN's new gTLDs policy and program were founded and developed. It is no coincidence that the same mindset in the same era that brought about the Great Recession also produced ICANN's policy and program for new gTLDs. About the Program | ICANN New gTLDs: "In 2005, ICANN's Generic Names Supporting Organization (GNSO) began a policy development process to consider the introduction of new gTLDs, based on the results of trial rounds conducted in 2000 and 2003. The GNSO is the main policy-making body for generic top-level domains, and encourages global participation in the technical management of the Internet. The two-year policy development process included detailed and lengthy consultations with the many constituencies of ICANN's global Internet community, including governments, civil society, business and intellectual property stakeholders, and technologists. In 2008, the ICANN Board adopted 19 specific GNSO policy recommendations for implementing new gTLDs, with certain allocation criteria and contractual conditions..."
What would Jon have done? 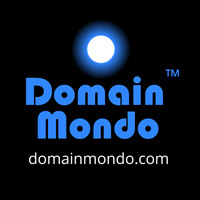 Domain Mondo Aug 25, 2014 | Are Domain Names Dinosaurs? : "John Gilmore said "Jon’s [Jon Postel] initial design would have expanded to dozens of TLDs long before ICANN, and increased them by 50 or 100 a year until demand slacked off" (source: It’s time for ICANN to go - Salon.com July 2002, emphasis added). But ICANN and its "ICANN community" didn't care what Jon Postel would have done. ICANN didn't care about "market demand" or how many new gTLDs could be reasonably, and profitably, supported by "market demand." ICANN didn't even listen to the FTC (see also this 2011 pdf), nor the former Chairman of the FTC, nor the founding Chair of the ICANN Board of Directors, nor anyone else, including the Antitrust Division of the US Department of Justice (pdf), all of whom could see that ICANN's new gTLDs expansion was fraught with pitfalls and unintended consequences. It was, after all, "all about the money" from which ICANN could justify "expanding hub offices, exorbitant salaries and benefits, exploding staff levels and budgets." So now we are beginning to see the consequences of ICANN's folly--perhaps a few "winners" and everyone else left with losses, and domain name registrants paying more, "much more" in domain name costs (see Mark Monitor's New gTLD Quarterly Report trend #3). New gTLD registry operators are now blaming trademark owners and brands for the new gTLDs' cybersquatting problems (see e.g., in Mark Monitor's New gTLD Quarterly Report, supra, "We found .CLUB to be the most squatted of all NgTLDs [new gTLDs] in this focus, with over 50% of the sampling found to be registered to someone other than the company or brand-owner"). Actually, everyone should be blaming ICANN for a "bad policy, horribly implemented"--the new gTLDs program. Survivors of ICANN's fiasco, like the prescient, will invest their money elsewhere--a good example being Web.com (see Web.com Chairman's quote near the top of this post). Web.com (NASDAQ:WEB) reported Q4 2015 earnings February 11, 2016 [Q4 EPS of $0.66 beat by $0.03. 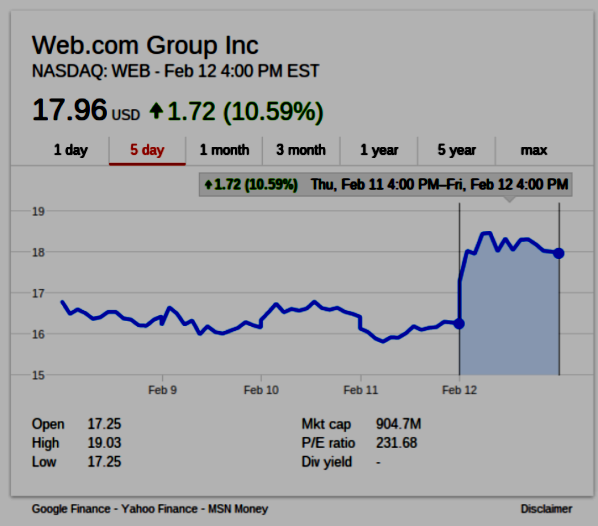 Revenue of $141.3M (+0.7% Y/Y) beat by $1.83M] but the big news was Web.com's announced acquisition of Yodle. Web.com brands include Network Solutions and Register.com, but Yodle (domain: yodle.com) is not a domain name registrar nor registry operator. Yodle's offerings include search engine optimization (SEO), email marketing, creation of websites and Facebook pages.